VU University Amsterdam is a leading research university in the Netherlands. Since it was founded in 1880, the VU has been known for its distinctive approach to knowledge. Social relevance is a guiding principle. The VU houses 14 interdisciplinary research institutes, 12 faculties, participates in two national research centres of excellence, one as coordinating institution, and is participant in 40 accredited research schools, 6 as coordinating institution. In total, the VU employs over 1,750 research FTE and yearly more than 6,650 academic articles, monographs and books are published and more than 300 doctorates are honoured. The focus of research at the department of Biological Psychology (around 50 FTE) is the analysis of individual differences in health, cognition, normal and abnormal behaviour, by studying the genetic and biological basis of individual differences in human behaviour, e.g. paediatric, adolescent and adult aggression, using approaches from genetic epidemiology, psychophysiology and molecular genetics. The department maintains the Netherlands Twin Register which was established in 1987 (www.tweelingenregister.org). In the NTR-Biobank project biological material (DNA, RNA, cell lines serum, plasma, and urine) is collected in over 10.000 participants. Relevant expertise: behavioural, molecular, human genetics, statistics, twin studies; analysis of individual differences. Relevant expertise: Longitudinal development of child and adolescent psychopathology/ well-being. Behavioural and molecular genetics. Relevant expertise: Child and adolescent psychiatry, behavioural, molecular, human genetics. Relevant expertise: Social, clinical, and developmental psychology; parenting; treatment of children exposed to violence and abuse. Relevant expertise: Department Manager & Project Manager for the ACTION Project. Relevant expertise: Analysis of DNA methylation data in combination with phenotypic and genetic data from twins and families. Relevant expertise: Child development, multiple informants. Relevant expertise: Metabolomics data analysis in combination with genetic or medical data. Relevant expertise: Coordination and collection samples. Relevant expertise: developmental genetic analyses, statistical genetics, psychological research. The main aim of the LUMC child psychiatry research program is to optimize identification of children in need of psychiatric care, and to monitor the effect of intervention longitudinally. Identification and monitoring includes using traditional diagnostic instruments (self report-questionnaires and interviews) as well as innovative ones, i.e. neurobiological markers. In order to ascertain correct identification of children with disorders, it is essential to focus on first line services (general practitioner, detention centers, child care), as most children will consult these services first. For this purpose, a qualitative and efficient system of diagnostic selection and follow-up (Routine Outcome Monitoring, ROM) is being developed. ROM will not only be helpful for the purpose of identification, but also for measuring the effectiveness of intervention in daily practice. Because psychological conditions related to psychiatric disorders may not always be visible or measurable by means of traditional instruments, innovative assessment methods must be developed. The research program (nr 31401) focuses on two main areas: (1) Patient Selection and Assessment: Child Public Mental Health (CPMH) and Routine Outcome Monitoring (ROM) and (2) Neuro-imaging. Our research focuses predominantly on the developmental psychopathology of behavioral disorders in children and adolescents. This includes both young children with emerging behavior problems (e.g. children with a first police contact) or adolescents in contact with juvenile justice. For this work, an Academic Workplace has been founded, which focuses in specific on practice based research. Relevant expertise: Child and adolescent psychiatry; Forensic psychiatry; Clinical epidemiology. Relevant expertise: Statistics and data management. Relevant expertise: Developmental psychopathology, youth and forensic psychologys. QIMR is one of the largest medical research institutes in Australia with a mission to deliver “better health through medical research”. Of direct relevance to this application, our philosophy is to “... support scientists who perform world-class medical research aimed at improving the health and well-being of all people”. The 2010 SCImago Institutions Rankings – Health Sciences World Report, provides quantitative data on research in Health Sciences between 2004 and 2008 as collected by the Scopus database. This report, which considered the “2,833 institutions that together are responsible for 80.55% of worldwide scientific output”, found that of the papers published in the 2004-2008 period by QIMR staff, 82.7% were in the top 25% of journals in their category (according to the SCImago Journal Ranking) and 49.3% of these papers involved at least one international collaborator. data is currently available for over 19,000 of these individuals, making this by far the largest collection of its type in Australia, and one of the largest in the world. Relevant expertise: Genetic epidemiology, Statistical genetics, project oversight. Relevant expertise: Pyschiatric genetics, Statistical genetics, Child and adolescent psychopathology. Karolinska Institutet (KI) is Sweden's only medical university and accounts for 40% of all medical research at universities in Sweden. It is comprised of 22 departments that span over a broad field of research, from fundamental research in molecular biology to public health research. The Department of Medical Epidemiology and Biostatistics (MEB) is one of the largest units for epidemiological research in Europe, employing about 270 staff members. MEB has facilities to invite subjects/twins for clinical investigations (interviewing, neuropsychological testing, clinical measures, blood sampling), and MEB also runs the core facility of KI biobank, including biological samples from more than 50,000 twins. Professor Dr. Paul Lichtenstein is the Director of the Swedish Twin Registry and an internationally recognized twin researcher, and is an expert on utilizing the unique possibilities of large register based research that exist in Sweden. His research focuses on psychological and psychiatric problems during human development. Paul Lichtenstein is PI or Co-investigator on several large scale twin and family studies. Relevant expertise: Psychological and psychiatric problems during human development. The University of Helsinki is the largest and best-ranked research university in Finland The Dept of Public Health is strongly profiled in genetic epidemiology and preventive medicine. The Finnish Twin Cohort Study is a core resource of the department with a core staff, 6 PhD students and 4 postdocs. The research topics mental health, personality and other behavioural traits. We also have facilities to see subjects, do interviewing, neuropsychological testing, clinical measures and blood sampling. An excellent office and computing environment is available at the Twin Study, at the Department of Public Health, with extensive experience in maintaining epidemiological and genetic study bases, coordinating data collection, management and analysis in multiple sites. Wet lab facilities are at the Finnish Institute for Molecular Medicine (FIMM), which has all relevant state-of-the-art equipment and core facilities with state-of-the-art technology and valuable expertise in genotyping, methylation assays and related omics work. Relevant expertise: Epidemiologist with expertise on behavioural risk factors, including externalizing behaviours and substance use/abuse/dependence. Relevant expertise: Overall responsibility for twin cohorts, genetic epidemiology. The Institute of Psychology, Psychiatry and Neuroscience has an outstanding international reputation in the field of research. In the most recent UK Research Assessment Exercise (2008), “the IOPPN had the largest number of world leading or internationally excellent research activity units” for Psychiatry. Since its foundation in 1994 the MRC Social, Genetic and Developmental Psychiatry Centre has grown into one of the research powerhouses of the IOPPN. The 2008 UK Research Assessment Exercise made special mention of the Centre twice in its commentary on the IOPPN: “evidence of world-leading outputs especially with respect to the social, genetic and developmental psychiatry (SGDP)” and “the environment was internationally excellent and in the case(s) of Social, Genetic and Developmental Psychiatry (SGDP), world leading”. The Twins Early Development Study is one of the foremost ongoing twin studies of its kind in the world. With the help of over 15,000 families, TEDS researchers and academics are exploring how we develop through childhood and adolescence and what factors contribute to making each of us who we are. In this way, the great wealth of information gathered through the study is providing insights into how both nature (the genetic material and characteristics we inherit from our parents) and nurture (our environment) contribute to individual development in a range of areas, such as cognitive and learning abilities, and behaviour. The study has been going since 1994 and is based at King's College London under the leadership of Professor Robert Plomin, ranked among the 100 most eminent psychologists in the history of science. Relevant expertise: Genetics of behaviour, both quantitative and molecular genetics. Relevant expertise: Statistical expertise in quantitative and molecular genetics. Relevant expertise: Quantitative and molecular genetics and behavioural development. Relevant expertise: Quantitative genetic analysis; genotype-environment correlation, especially in relation to media use in young adults. Relevant expertise: Quantitative genetic analysis; pubertal development; public understanding of science. Erasmus MC is the largest university medical center in the Netherlands and is known for its high quality and epidemiological and neuroscience research. The Department of Child and Adolescent Psychiatry consists of clinical facilities, teaching and research facilities. research of the Department of Child and Adolescent Psychiatry mainly consists of general population and clinical epidemiology and is part of the Netherlands Institute of Health Sciences. The Department of Child and Adolescent Psychiatry has a 30-year track of epidemiological research and is internationally known for this work. The main activities pertain to longitudinal epidemiological and research of diagnostic assessments, with anemphasis on assessments of psychopathology from childhood into adulthood. The Department is leading in Europe as far as standardised diagnostic assessment procedures are concerned and is one of the strongests centers in Europe of aetiological epidemiological research in the field of child psychopathology. The Department leads behavioural/cognitive section of a large-scale longitudinal birth cohort, GenerationR, which is internationally known for its innovative methodology and results. Relevant expertise: Aetiology of antisocial behaviour. Relevant expertise: Aetiological research of complex phenotypes. The Quantitative Psychology Program of the Department of Psychology at the University of Notre Dame is one of the leading quantitative programs in the US. With seven faculties covering expertise in all major areas in behavioural statistics it is also one of the largest programs. Weekly program meetings that regularly feature invited speakers provide an intellectual environment that highly stimulates exchange of expertise and the development of novel statistical approaches. The Center of Research Computing (CRC) at Notre Dame houses two complementary resources: the High Performance Computing section, providing over 8000 cores of computational power with the associated support infrastructure for both hardware and installed software, and the Cyberinfrastructure section, empowering Faculty and industry partners to develop research environments that support advanced data and information processing services including acquisition, storage, management, integration, mining and visualization of data. Relevant expertise: Analyses of complex phenotypes, genome-wide analyses, twin research, variance estimation methods using genetic data, data mining methods. Vassilios Fanos is chief of the following divisions: Neonatal Intensive Care Unit, Puericulture Institute, and Neonatal Section. The research team comprises a clinical pathologist, expert in metabolomics, a biotechnologist, a physicist, a bioinformatics, 5 experts in NMR and GC-MS, 2 fellows. 49 collaborations in metabolomics, including New York, Washington, Calgary, Cambridge, Porto, Lisbon, Athens, Thessaloniki, Maastricht, Utrecht, Ankara, Amsterdam, Kuala Lumpur and many Italian centres. English) one is Developmental Nephrology: from embryology to metabolomics with RL Chevalier), Organization of 2 specific International meetings on metabolomics (published as Guest Editor in J Maternal Fetal and Neonatal Medicine). He has given several international lectures on metabolomics: final lecture International Congress of Pediatric Laboratory Medicine, International Perinatal Collegium Amalfi, World Congress of Twins Florence, European Workshops on Neonatology in Vila do Conte (Portugal), Segovia (Spain), Tallin (Estonia), International Meeting UENPS, International Congress of Neonatology Athens, Invited speaker in Amsterdam Royal Academy of Science 2013, International Congress BDebate Barcelona 2013, World Congress of Perinatal Medicine Moscow 2013. Relevant expertise: Pediatrics, Neonatology, Pharmacology, Metabolomics, Sepsis, Drugs, Nephrotoxicity, Post-partum Depression. Relevant expertise: “Omics”, namely Metabolomics, NMR, Clinical Pathology, Statistics, Bioinformatics, data management. Relevant expertise: Biochemistry, Mass Spectrometry. Relevant expertise: Experimental medicine, Pediatric Laboratory. Relevant expertise: Accounting and finance, Management, Communication, Health care administration. Relevant expertise: Biotechnologies, Laboratory Medicine, Metabolomics and related data management. Relevant expertise: Clinical research, IUGR, GDM, Metabolomics, Perinatal Programming, Nutrition. Relevant expertise: Biotechnologies, Laboratory Medicine, Metabolomics. Relevant expertise: Web management and editing, Science Dissemination and Exploitation, Communication and Public Relations. Relevant expertise: Biology, Nutrition, NMR, Metabolomics. GBS is a successful spinout organisation from TNO (Netherlands Organisation for Applied Scientific Research). With over 30 years of experience GBS offers a perfect blend between expertise and cutting edge approaches. GBS holds a longstanding position within international collaborative networks between pharmaceutical companies and universities for scientific research projects. GBS conducts research laboratory services for the study of biomarkers, as well as providing advise on the selection of biomarkers for research protocols and the validation and devising of (new) tests and execution of large (up to 10.000 samples) assay series with state of the art equipment. GBS also works continuously for its own research projects, constantly expanding the capabilities. GBS has a portfolio on urinary markers measured mainly by enzyme immune assays for the detection of haemostasis activation, oxidation status, diabetic conditions and for tubular damage. A biobank of urine samples typed for creatinin and micro-albuminuria is available and used for analytical validation of methods. GBS performed large series of assays for the Netherlands Twin Register on cytokines, cotinine, liver enzymes and traditional markers of lipid and carbohydrate metabolism en inflammation (CRP) GBS works with Good Clinical Laboratory Practice guidelines and maintains high standards in documentation and customer focus. Prof Cornelis Kluft (CK) is a biomarker specialist with a major research interest in inflammation and vascular disease- being one of the first leaders to promote the inflammatory hypothesis of vascular disease. He developed the early CRP assays for clinical and research use and has extensive knowledge and expertise of marker analysis in metabolic diseases. Relevant expertise: Coordinating lab analysis and secure GCLP quality. The Division of Analytical Biosciences at Leiden University is the initiator of the Netherlands Metabolomics Centre (NMC), a multidisciplinary partnership including key academic players, clinical centers, and others (funded by Netherlands Genomics Initiative NWO grant). At Leiden University a world class metabolomics knowledge infrastructure has been created to develop novel analytical methods to analyse metabolites that are relevant for health and diseases, and to characterize the actual metabolic state of a persons. This requires both hardware and software developments supported by a well-established infrastructure of standardized methods and applications. A wide range of separation-techniques (HPLC, UPLC, Micro- and Nano-LC, Capillary electrophoresis and GC) are available next to an array of Mass Spectrometry systems housing a variety of techniques (Triple quadrupole, Ion-trap and ion-trap hybrids with FT-ICR and FT-Orbitrap, Q-ToF, GC-ToF and Maldi-ToF) allowing in-depth MS profiling. Algorithms have been developed for the de-novo identification of metabolites. Protocols and algorithms have been developed for the analysis of larger epidemiological or clinical cohorts of more than 5000 study participants. A large part of the metabolites detected are identified, and a large amount of them are reported as absolute concentrations if reference compounds are available. Relevant expertise: Analytical Biosciences / Metabolomics, Development of systems biology. Relevant expertise: Metabolic Diseases, experimental design and the biologicalt. Relevant expertise: Mass Spectrometry / Metabolomics. Relevant expertise: GC-MS, quality systems. 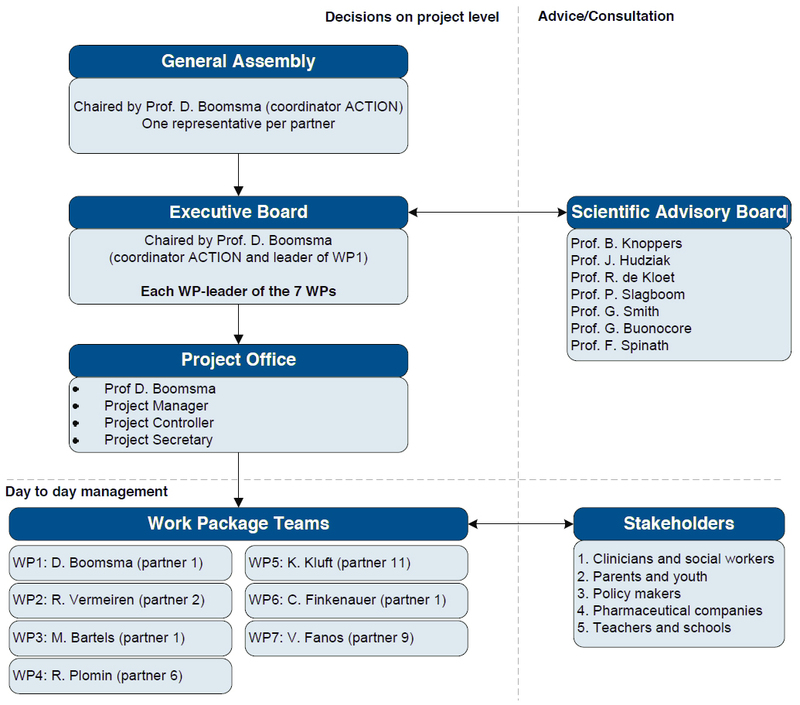 The management structure of ACTION has three levels on which decisions are taken. Depending on the kind of decision or its consequences for the consortium, a variable number of partners are involved in the decision making. Expertise/Reason: Ethics, law and biobanks. Professor of Molecular Epidemiology at the Leiden University Medical Center Head of the section of Molecular Epidemiology and a Genotyping Center. Expertise/Reason: Epidemiology and childhood cohorts. Professor of pediatrics and Director of the Unit of Neonatology of the University Hospital of Siena, Italy. President UENPS and President EURAIBI. Expertise/Reason: Behavior Genetics, Twin studies. Expertise/Reason: Privacy, data protection law, Legal aspects of genetics. Expertise/Reason: Philosophy and Ethics of Medicine.